Hardcover, 6.75 x 9.5 in. / 368 pgs / 14 color / 385 duotone. In his previous project Migropolis, Wolfgang Scheppe proposed Venice, Italy, as a prototype of the increasingly globalized city. Here, the German philosopher reexamines the city from another perspective. Done. Book is an "inquiry into the depth of visual archives," and how the archives of a city can aid an understanding of its society. 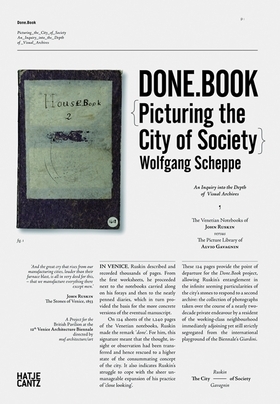 Under this rubric, Scheppe compares two obsessive attempts at archiving or summating Venice: the Venetian notebooks of English art critic John Ruskin (1819-1900), compiled for his classic study Stones of Venice, and previously unseen photographs assembled by Alvio Gavagnin (born 1944), a contemporary resident of the city's working-class district. Despite their differences, both projects stem from a similar self-imposed commitment on the part of their makers: to provide a comprehensive representation of the details of an urban network, whose truth can be glimpsed in the minutiae and hidden particulars. 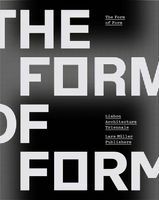 The methodological models for urbanism are plentiful, ranging from the recent revival in cartography to the boom in infrastructure theory, but Wolfgang Scheppe’s Done.Book: Picturing the City of Society offers a wonderfully original take on the city he has made his ongoing object of study, Venice. 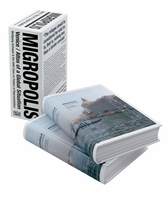 Migropolis, Scheppe’s massive two-volume saturation job on Venice from 2010, adopted an impressive and thorough but not unfamiliar psychogeographic method for excavating the city’s layers, in which various mappings were undertaken through walks around the city. Done.Book is a more eccentric enterprise. Described by Scheppe as “an inquiry into the depth of visual archives,” it assembles a portrait of Venice through two sets of archival materials: the notebooks used by the Victorian art writer John Ruskin (1819-1900) for his legendary 1851 study Stones of Venice and the photographic archive of one Alvio Gavagnin, a Venetian market seller and non-professional photographer who bequeathed Scheppe his archive after they met at Gavagin’s stall. FORMAT: Hbk, 6.75 x 9.5 in. / 368 pgs / 14 color / 385 duotone.